Before the lesson, students work individually on an assessment task that is designed to reveal their current understandings and difficulties. You then review their work and create questions for students to answer in order to improve their solutions. After a whole-class interactive introduction, students work in pairs on a collaborative discussion task in which they match quadratic graphs to their algebraic representation. As they do this, they begin to link different algebraic forms of a quadratic function to particular properties of its graph. In a follow-up lesson students attempt to improve their original response to the assessment task. 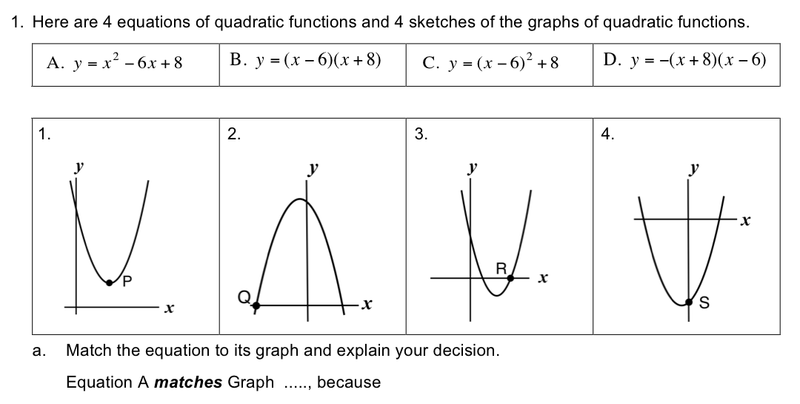 Each individual student will need two copies of the Quadratic Functions assessment task and a mini-whiteboard, pen, and eraser. Each pair of students will need Domino Cards 1 and Domino Cards 2, cut into ten ‘dominoes’. 15 minutes before the lesson, a 95-minute lesson (or two shorter lessons), and 10 minutes in a follow-up lesson. Timings are approximate and will depend on the needs of the class.